"DESTINY! DESTINY! NO ESCAPING THAT FOR ME!" How in the world could MEL BROOKS follow a box office smash like BLAZING SADDLES? 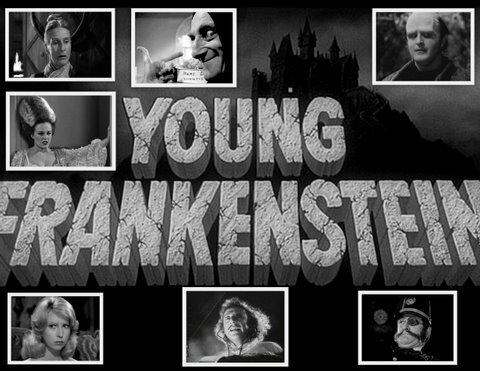 It was simple (well, probably not)...but he managed with the late 1974 release of YOUNG FRANKENSTEIN, the maniacal filmmaker's tribute to the classic Universal studio's horror features of the 1930s and 1940s. Centering on the three features in which Boris Karloff played the monster (FRANKENSTEIN in 1931, BRIDE OF FRANKENSTEIN in 1935 and SON OF FRANKENSTEIN in 1939), Mel, in the opinions of many, actually topped his BLAZING SADDLES creation of a year earlier. On a shooting budget of around three million dollars, YOUNG FRANKENSTEIN would bring in over ninety million bucks in the U.S. alone. Nearly forty years after its initial release, factoring in the revenue from tickets sold internationally, VHS, DVD, network and cable TV sales, it could approach half a billion dollars in terms of income. ﻿"Yes. Yes. Say it...He was...my BOYFRIEND!" ﻿"For the experiment to be a success, all of the body parts must be enlarged." "He vould have an enormous schwanzstucker." "He's going to be very popular." ﻿"You know, I'm a rather brilliant surgeon. Perhaps I can help you with that hump." ﻿The hilarity went from the opening scene to the last, and audiences loved it.